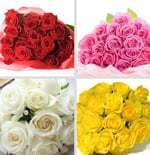 There are dozens of reasons to send long-stemmed roses and no matter what the occasion, they never fail to touch the heart. 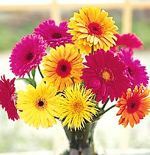 In the language of flowers gerbera's convey innocence, modesty and purity, while white gerbera's indicate innocence; yellow gerberas say 'I'll try harder' and orange gerberas say 'You are my sunshine'. Carnations are a traditional expression of love and devotion, and a favorite with European gardeners because they have a rich fragrance and timeless, long lasting beauty.